The NUPSIG project will aquire data and knowledge about gravel beach storm impacts from several sources, and use this information to develop a coastal management tool voor gravel beaches. 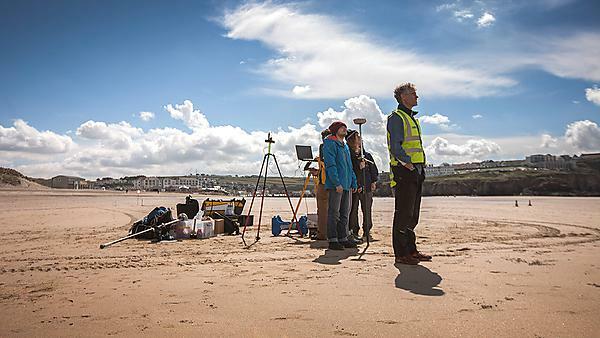 The NUPSIG project will collect data on beach changes at eleven sites along the southern coast of the United Kingdom. In addition to these surveys, the NUPSIG project will carry out a detailed six-week field experiment at Loe Bar, Cornwall. ARGUS video images at Slapton Sands, as well as temporary cameras at the Loe Bar field site will be used to increase our understanding of how gravel beaches respond differently along the coast. Data measured by instruments on and above the beach will be used in conjunction with computer models to predict what gravel beaches are at risk of flooding, and help coastal managers devise defence strategies.